Ornamental grass adds grace, interest and color to your landscape. Gardens have taken on a whole new dimension since the advent of hundreds of new cultivars suited to all types of soil, climate and shade tolerance. Whether you're using grass as a ground cover, as a specimen plant or in a perennial border, wetland or rock garden, choose plants for their unique form, showy seed head or attractive foliage. 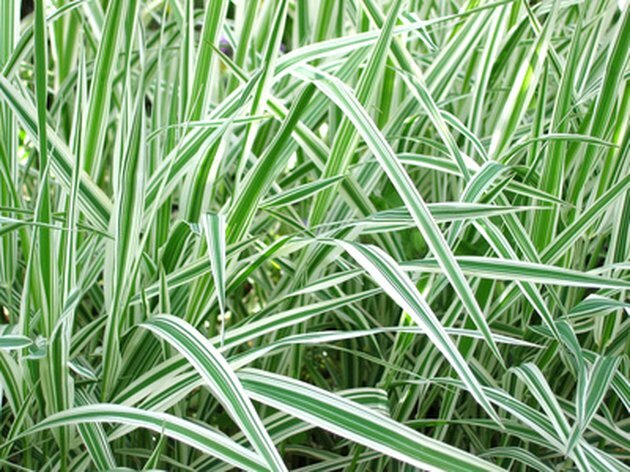 Many ornamental grasses are available as a variegated cultivar. When making your selections, look for variegatum or variegata in the description. This Latin term means varicolored or having a variety of color. Ornamental grass adds grace, interest and color to your landscape. From problem areas to border edging, lily turf is a low-maintenance ground cover that offers homeowners an attractive solution for use in the landscape. Also known as monkey grass, liriope, mondo grass and snakesbeard, this grass tolerates both heat and drought and grows in all types of soils. Variegated lilyturf thrives in shade or sun in USDA Plant Hardiness Zones 5 through 9 (see Resources). Spreading by rhizomes, it could become invasive. Ribbon grass, also called reed canary grass, features prominent striped green and white foliage that grows to a height up to 2 feet in zones 4 to 9 as a non-traditional ground cover. With a look similar to bamboo, this perennial grass spreads rapidly by rhizomes and quickly covers slopes or wherever a ground cover is desired. Perennial maiden or silver grass, Miscanthus sinensis, grows in many varieties ranging from 3 to 10 feet tall. With an upright to arching form, it thrives in zones 4 to 9. Flowers that resemble corn tassels move with grace on slender stems in the landscape. Linear blades of green foliage with silver stripes add further interest. Most varieties prefer full sun in well-drained soils but easily adapt to poor conditions once established. Overdam is a variegated perennial feather reed grass with creamy-white vertical stripes along the edges of green leaf blades. It blooms in early to mid-summer with ivory-colored grain-like spikes. Overdam grows to 4 feet tall in hardiness zones 3 to 6. It does well in most soils with moderate moisture. Foliage color excels in climates with cool summer nights. Reed sweetgrass, Glyceria maxima variegata, sometimes called tall mannagrass, grows in wet areas, from the shoreline edge to water up to 6 feet deep. This fast-growing perennial forms stands of narrow green reeds striped with cream and sometimes tinged with pink. Hardy to zone 4, reed sweetgrass grows to 8 feet tall and can become invasive. Striped tuber oat grass or variegated bulbous oat grass grows in sun or partial shade in zones 4 to 9. This slow-growing perennial mounded grass reaches a mature height of 12 inches. Its fine-textured striped blades appear spiky but are soft to the touch. Bulbous oat grass prefers cool nights and dry conditions. It grows easily in containers or as a ground cover. The foliage color is greatest in full sun. Variegated Japanese sedge grass provides bold accent in the rock garden with striking white on green foliage. Growing up to 12 inches tall, in zones 5 through 9, this plant tolerates moist soils but prefers well-drained ground in sun or partial shade. Divide this plant every few years in spring to insure a healthy, full plant. What Is the Fastest Growing Ground Cover?